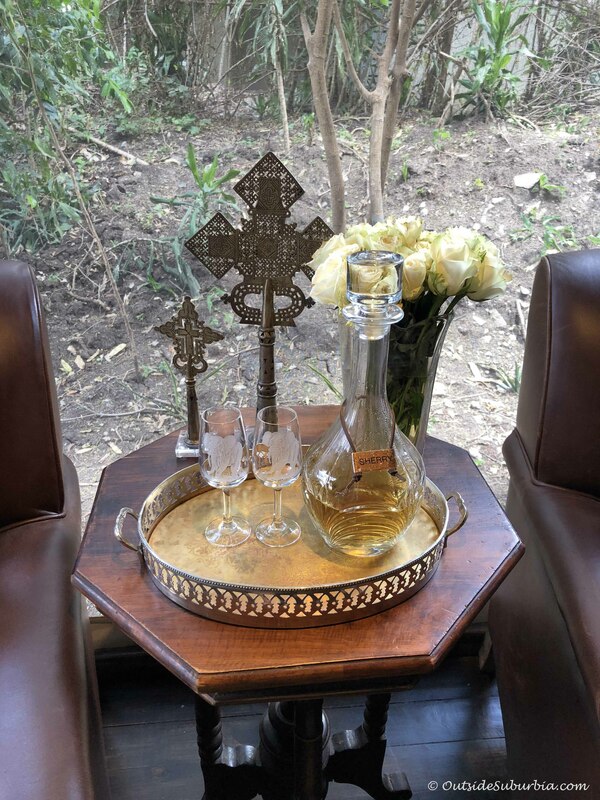 Our first Safari Camp experience was nothing short of extraordinary, we were welcomed with champagne in crystal flutes with elephant motifs and friendly smiles. 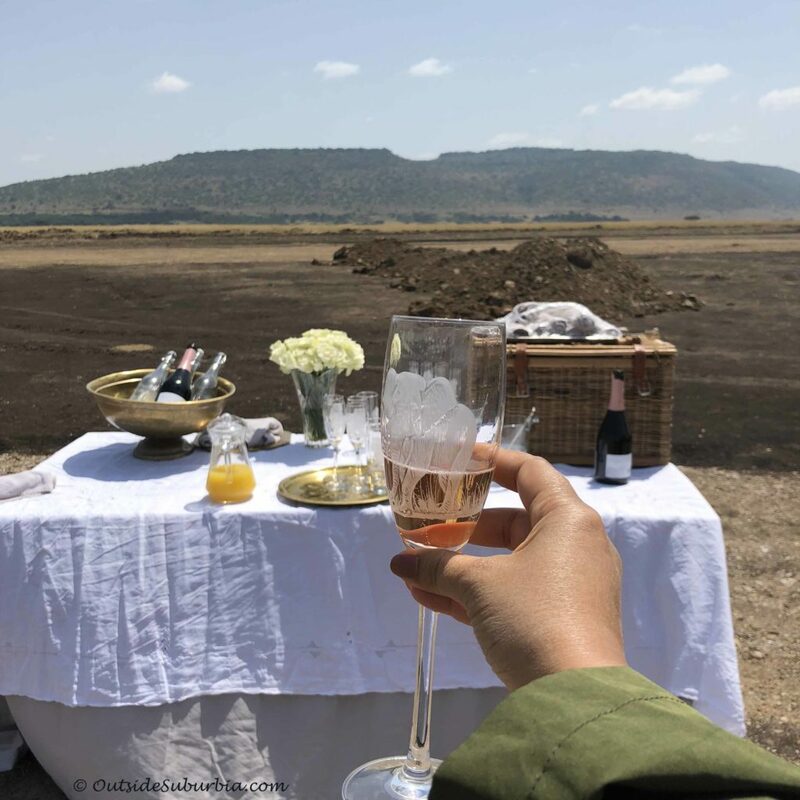 The staff at Bateleur AndBeyond Safari Camp had setup a welcome table with white roses at the dusty airstrip where our small bush plane landed. 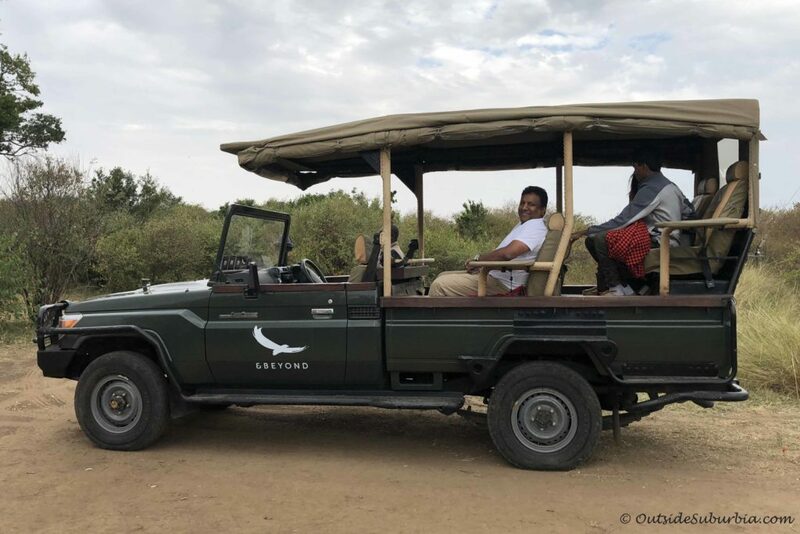 While we chatted with our guide, our bags were loaded and we were on our way to the luxury tents on our very first Safari in Kenya. 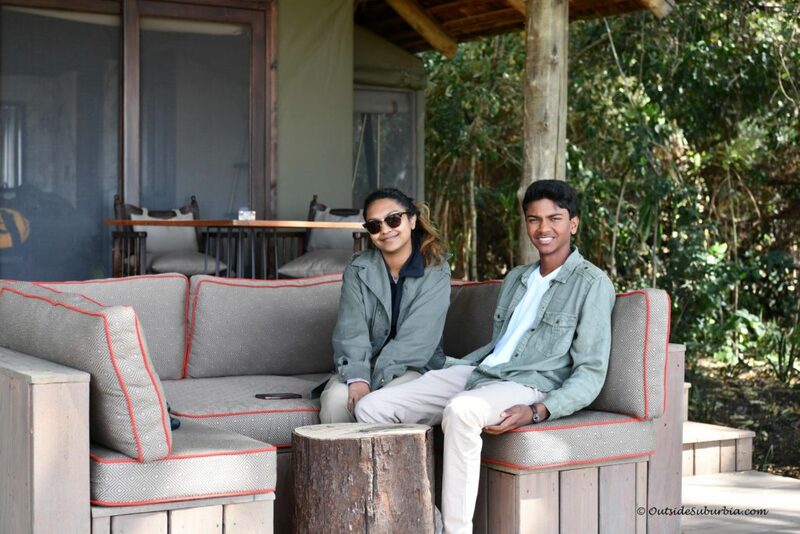 The warmth of the staff and the incredible safari experience during our stay at AndBeyond Bateleur Safari Camp blew us away! 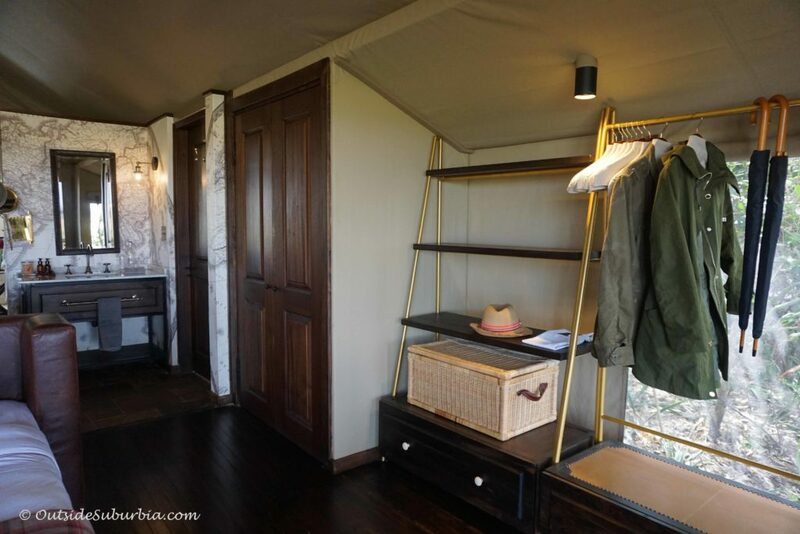 Kichwa Tembo Bateleur Camp offers just 2 sets of nine exquisite tents, each filled with beautiful antiques, wonderful linens and lush carpets. 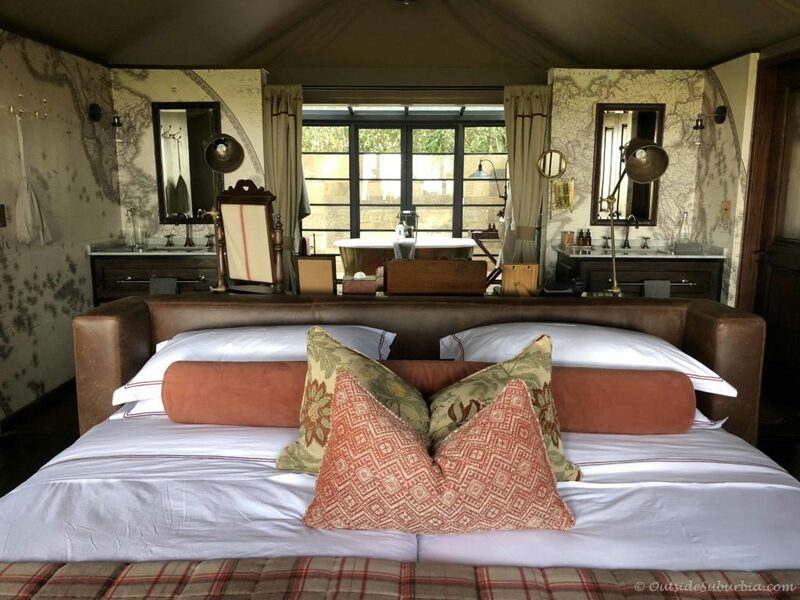 The luxury camp is tucked away at the foot of the scenic Oloololo escarpment – the rim of the Great Rift Valley, in Kenya’s iconic Masai Mara National Reserve. The olive tents might look simple from the outside but it is designed with all the comforts that you would find in a luxury accommodation. 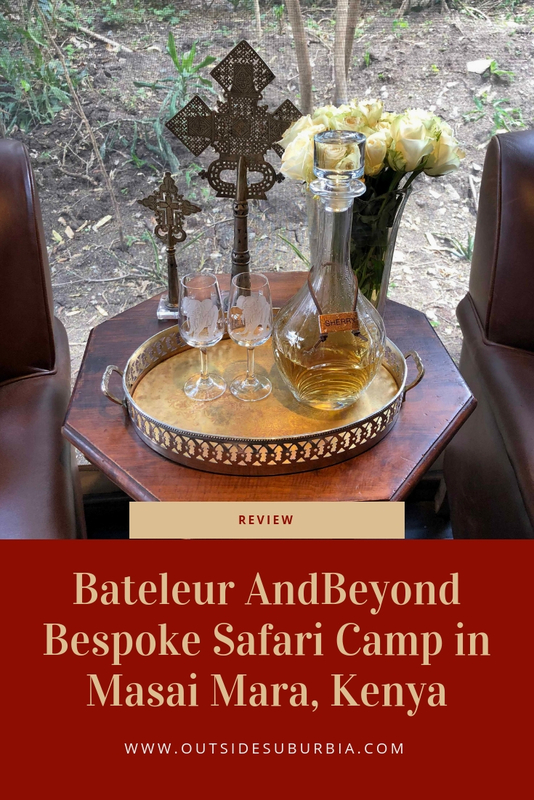 It was definitely not what I though safari tents looked like – from the antique map wall paper to the brass fixtures, crystal carafes filled with gin and sherry, jar filled with cookies – they had though of everything to made you feel special. 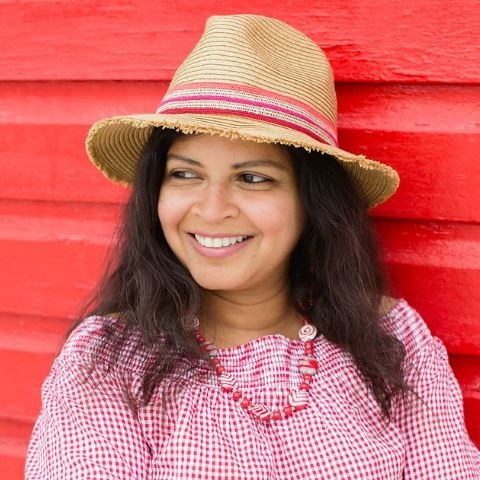 Warm and friendly smiles everywhere – we instantly felt at home, 10,000 miles way, in the middle of the African Savannah. Reminiscent of a bygone era, the common spaces are furnished with polished leather chairs, comfy sofas in jewel colors, leather trunks, old books and bound maps. There was fine china and sparkling crystals adding to the vintage safari vibe. The rooms were an epitome of classic elegance with polished wooden floors, oriental rugs, writing tables and a four-poster bed. 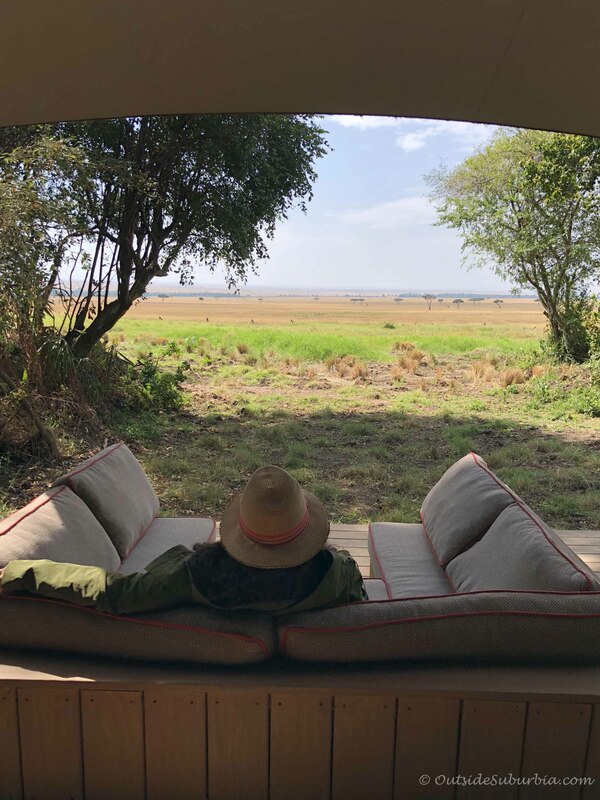 Each tent has a private deck overlooking the vast game-filled plains of the Maasai Mara, and a personal butler to ensure your every need is catered for. 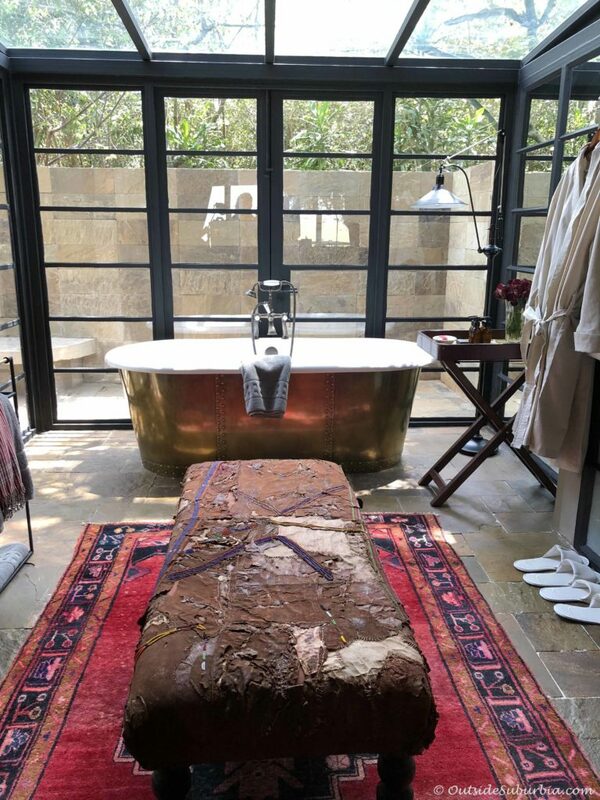 The bathrooms were beautiful with a footed copper bathtub, oriental rugs, double vanity sinks, outdoor shower area and beautiful fixtures and touches including a vase of beautiful red roses. 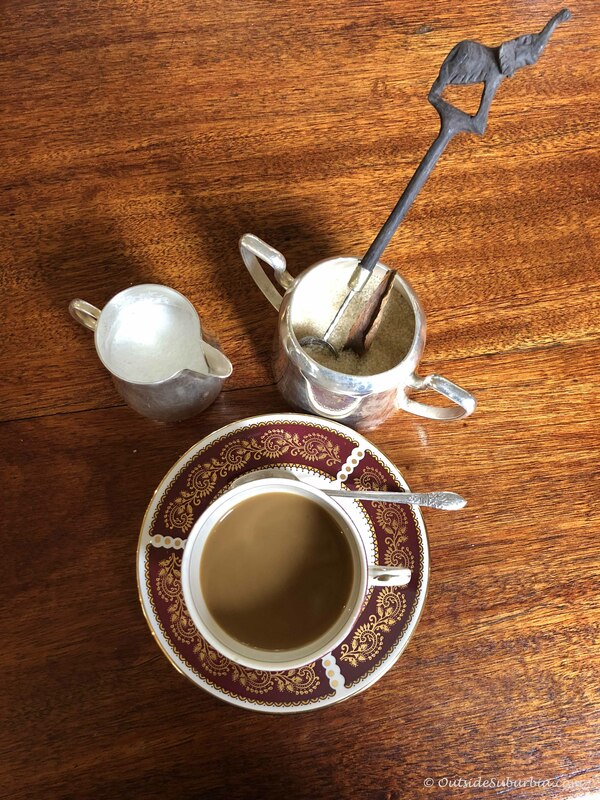 We were woken up with coffee that the butler left at the butler’s pantry promptly at 6:30 in the morning. We had an hour before our morning safari. We spent some time outside at the deck looking at the hot air balloons rising up before heading for breakfast. 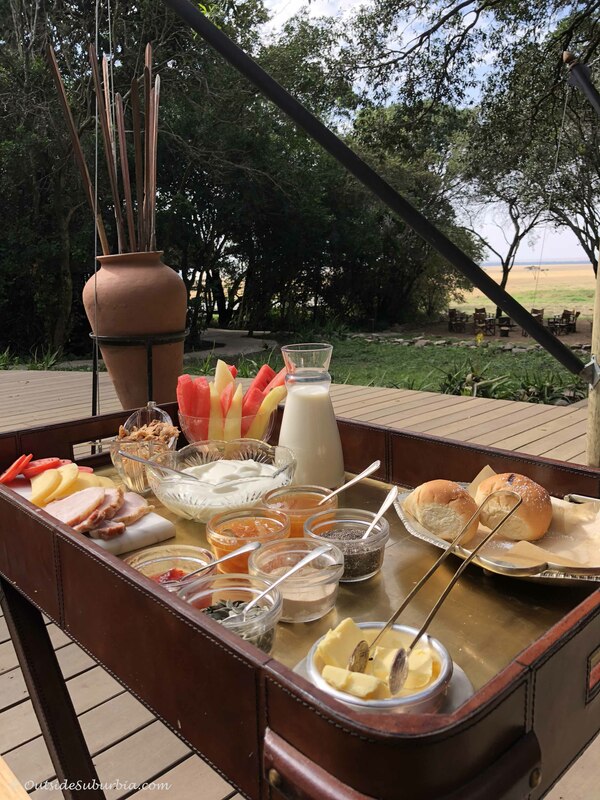 Omelettes, baked beans, breads and fresh juices – bush breakfasts on the edge of the Rift Valley were an quiet an unforgettable African experience. Adventures at &Beyond Bateleur Camp include twice-daily game drives, including spot-lit night drives. 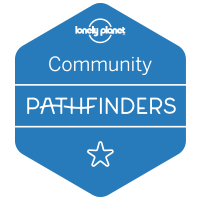 The camp also offers a range of additional activities such as bush walks, hot air balloon safaris and community excursions that include interactions with the Maasai. 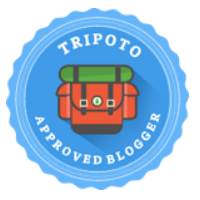 We choose to do our balloon safari in Serengeti but enjoyed watching the balloons float up the sky in the mornings. 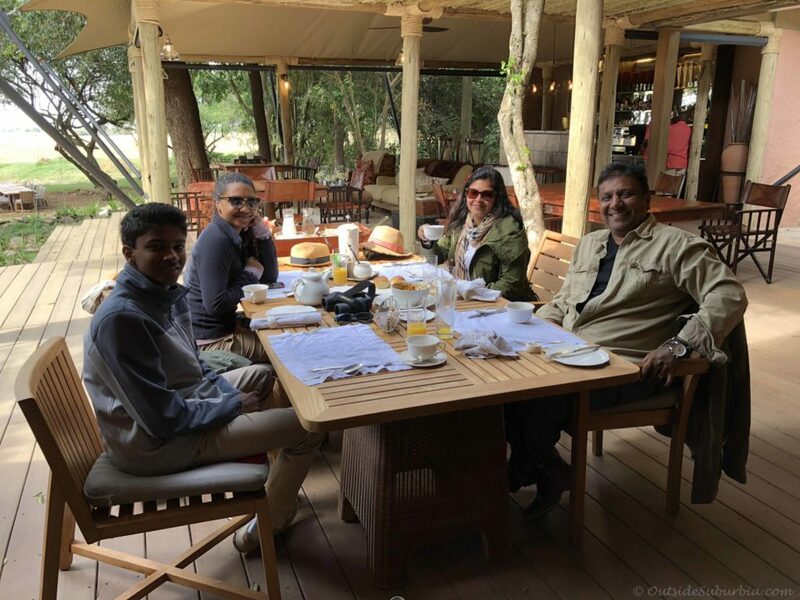 The nice thing about the safari drives with Bateleur Camp is that you can decide what you want to do for the day. 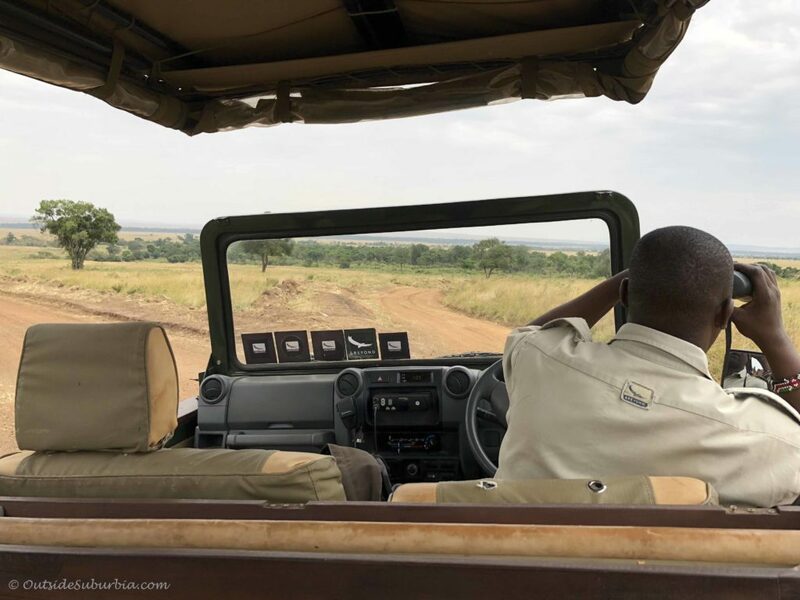 Since it was our first ever safari, our guide made sure we had great time. Except for the elusive leopards, we saw 4 of the Big 5 – lions, elephants, wild buffalo and a black rhino. We saw quite a few other animals and colorful birds as well. We were able to capture some amazing wildlife images during our trip. 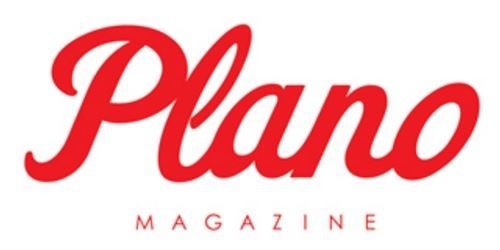 You can see them here. 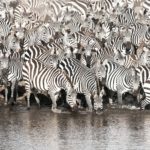 By no means a professional wildlife photographer, this trip made Mr.Suburbia fall in love with wildlife photography and he can’t wait to go back to Africa and Kenya again. 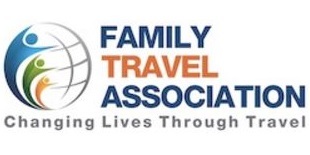 He was already mapping out an itinerary on the flight back home! 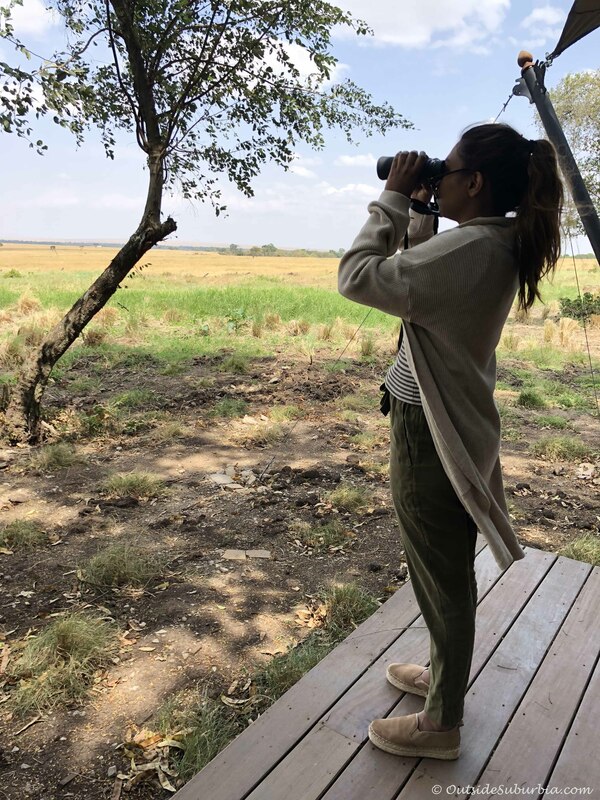 The area around the Bateleur Kichwa Tembo Camp is teeming with wildlife, we saw giraffes and zebras right from the comfort of our outdoor deck. 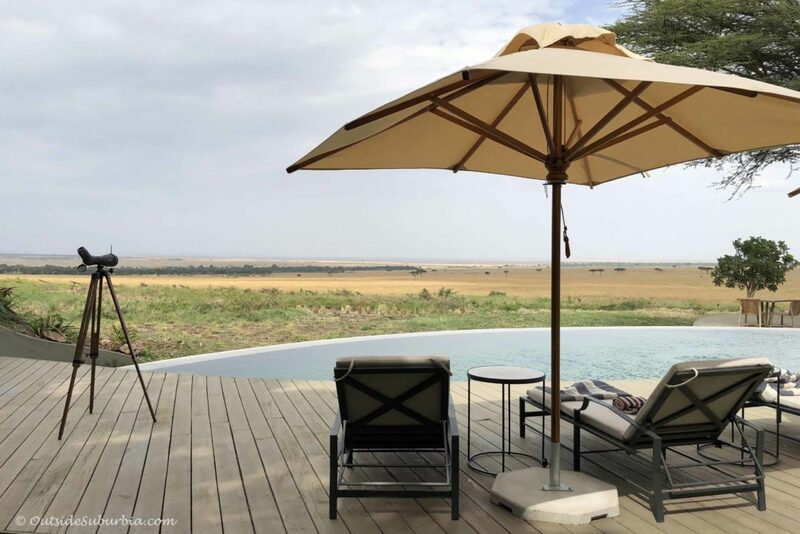 A deep lap pool offers a romantic setting overlooking the Mara plains and the forests. 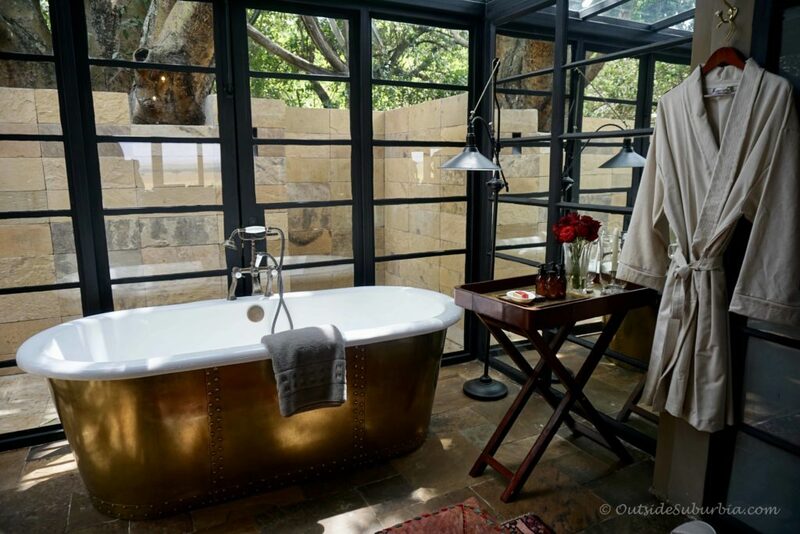 Perfect to relax in between safari drives. 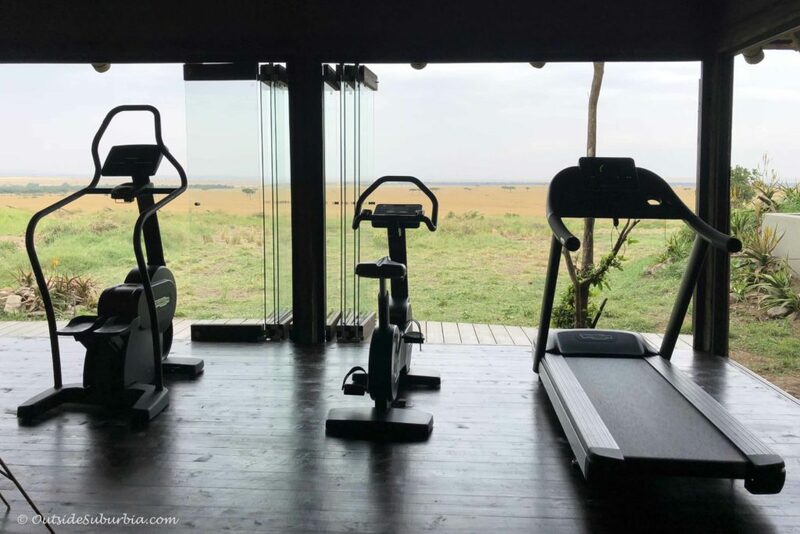 If you choose to hit the gym, you won’t miss out on the epic views, the workout room has views of the Masai Mara savannah. 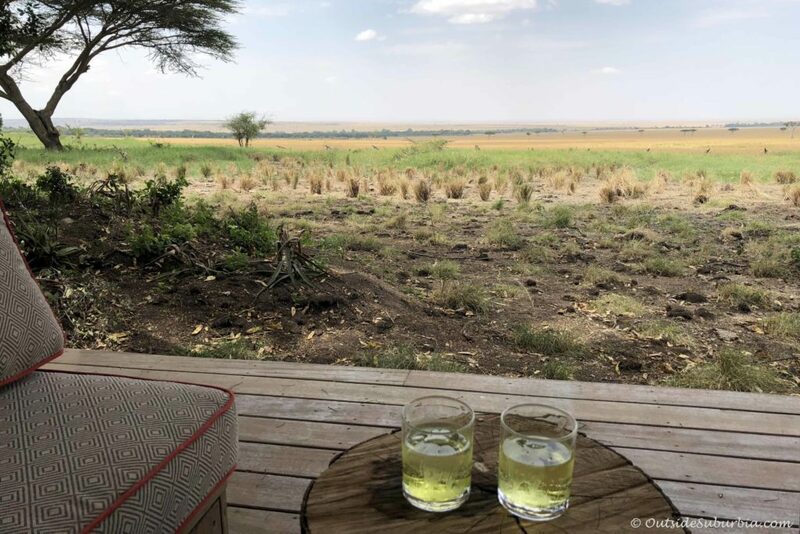 We had unforgettable wildlife sightings and romantic sundowners right from the deck of our safari camp. When the sunsets, warm glow of torches and candles welcome you home from your evening drive. Dinner is served under the moon and beneath the stars. 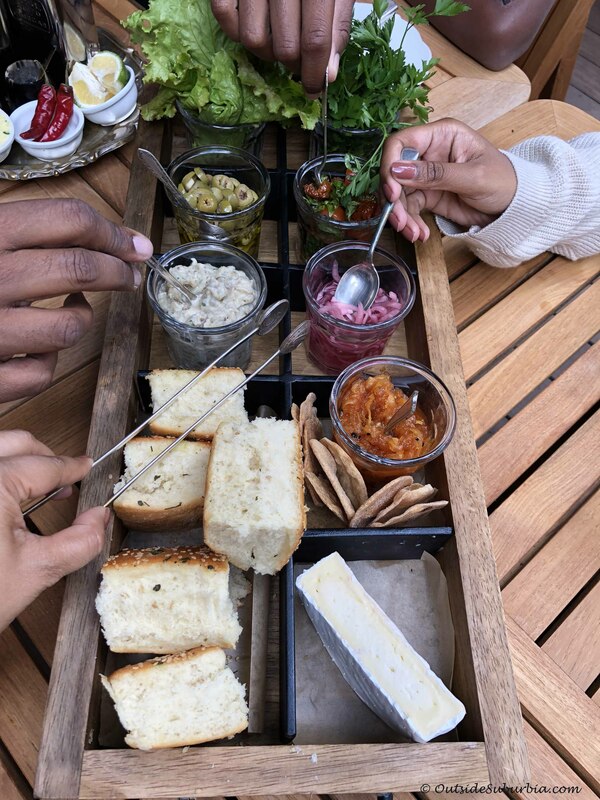 We started off with some nice wine, cheese and spreads. Earlier in the day, the chef checked with us as to what we would like for dinner. 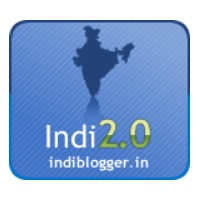 When I mentioned I would prefer vegetarian, he offered to make some lentils, chapatti and some vegetable curry. The rest of the family had prawns and chicken for their main course. The meals were delicious and served on fine china, crystal and silver that sparkled in the torchlight. 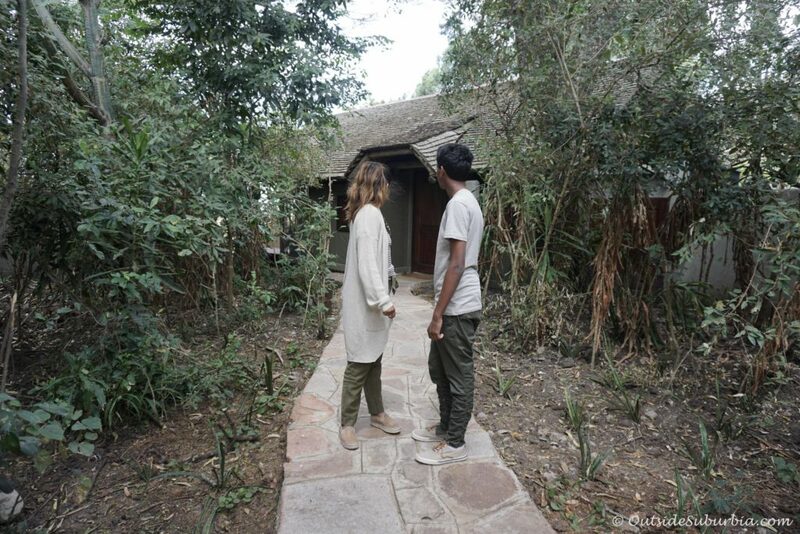 It was followed by a Masai dance and safari conversations around a bonfire. 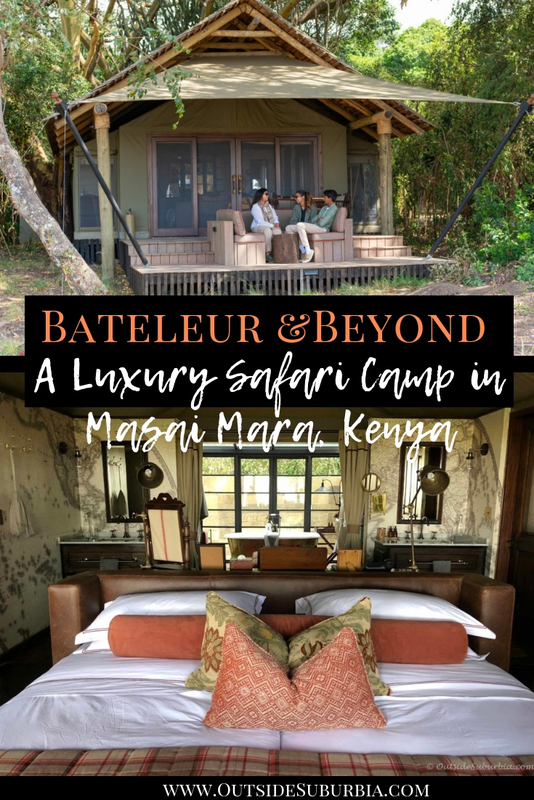 What we loved most at Bateleur Camp Masai Mara that is was an exclusive experience. 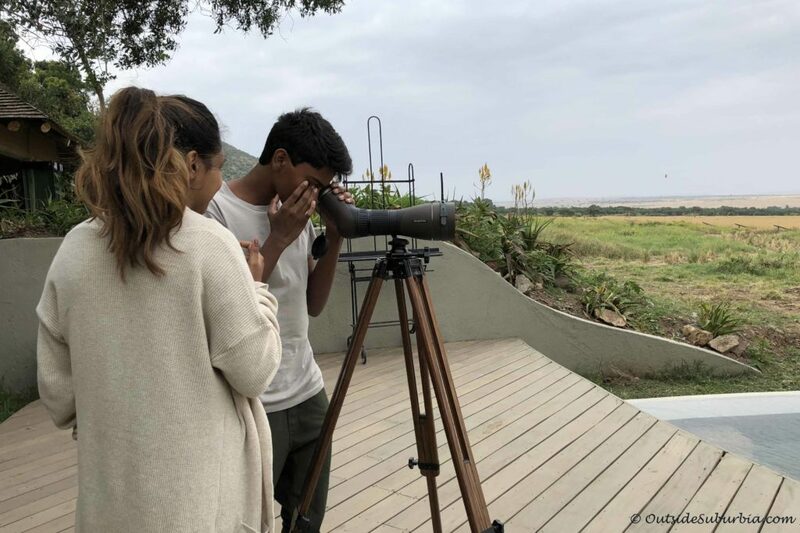 Bateleur camp is perfect for families, children are welcome, but for safety reasons children under age 11 must share a tent with their parent or guardian, an extra bed can be brought in to make the tent a triple. Since our kids were older we had two tents. From laundry to drinks to safari drives everything was included in the price of the stay at the camp. I loved all the antiques, the crystals with the animal etchings, the collection of china from different parts of the world. 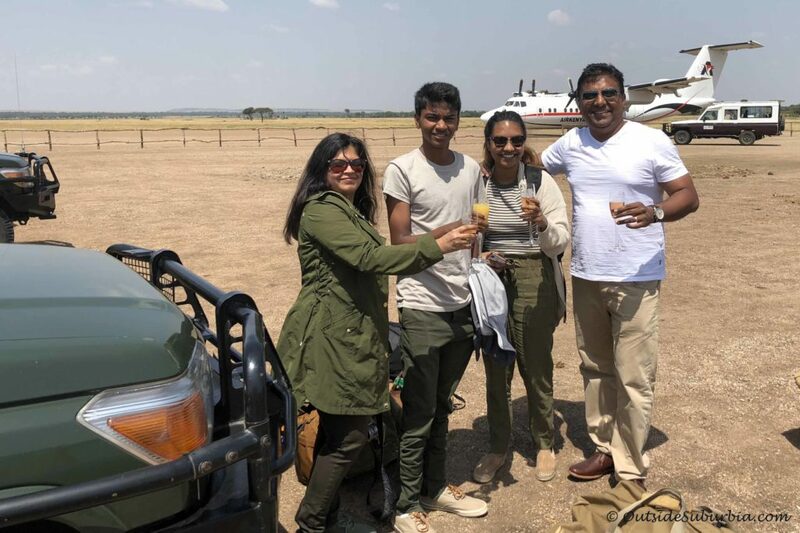 But what we will always remember though is the champagne welcome at the airstrip and the welcome song that the whole crew sang when our jeep pulled into the camp, got even the shy boy to dance. 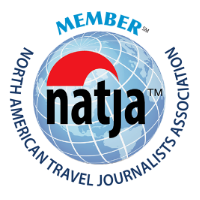 The service and experience was top notch and worth the money. 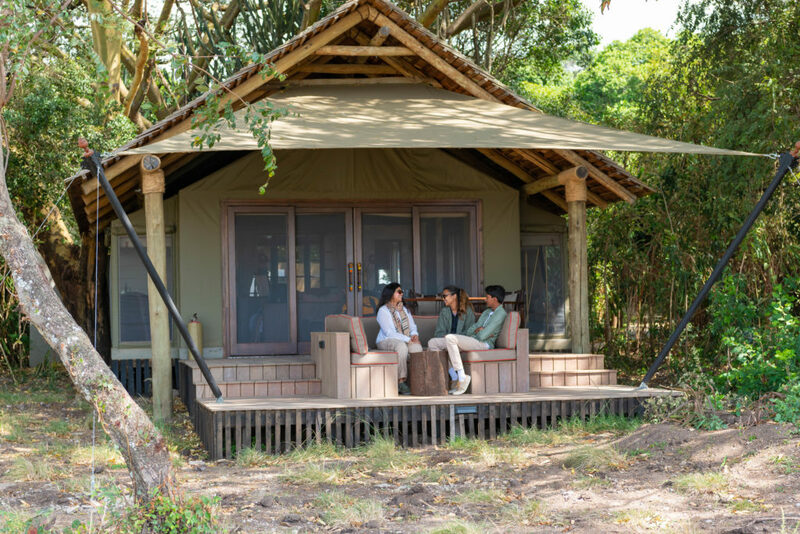 Masibo the camp manager always welcomed us when we came in from the safari trips and asked how the day was and his response to every request was “Hakuna Matata” – No worries or No trouble – No was in not in their vocabulary! 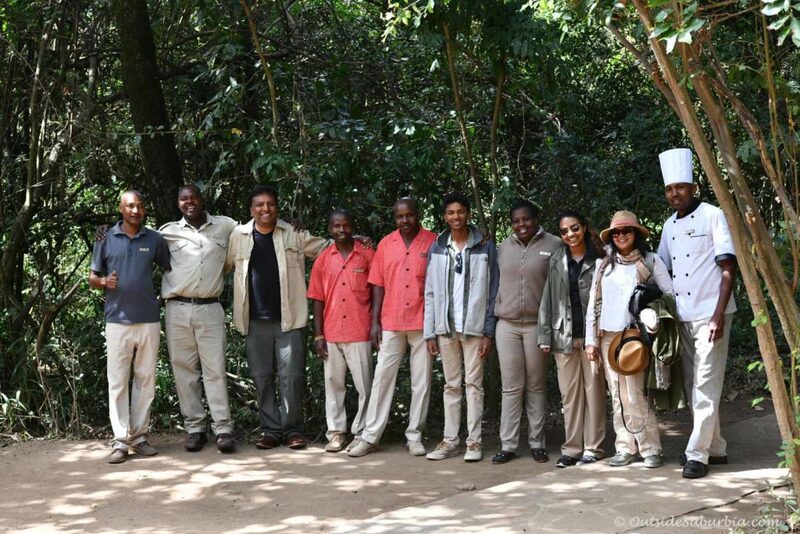 It was hard to say goodbye to Masibo, the camp manager (who took the photo) and his team at Bateleur AndBeyond Safari Camp but we know we will be back!